Pre-make the tea using a pinch of Saffron filaments. Add boiled water to the Saffron and allow to cool. Spoon out the Avocado and the Grapefruit and chop both. Measure out the powders and add all ingredients to a blender. Sit down, breathe and enjoy! As you know if you have been keeping up with us here at PeaceCrafting, we are totally raw and organic superfood manic and love to try new things especially if they are packed with superfoods! I am slowly getting to know more and more of the named superfoods and my ‘pantry’ cupboard is now starting to look like the shelves in the local health store, expensive but yay!! Can’t put, a price on your children’s health right? I mean once your ethics agree with something you can’t just ignore it can you? If you’re like me you’ll get an icky sensation until you iron out the creases and follow yourself fully (seems to be the answers to all problems but that’s another post ;). Besides family and nature, food has become my biggest passion over the last couple of years, well since I discovered the poison Aspartame actually and its disgraceful abundance in the public food market. More recently, since following a strictly vegan lifestyle, I have become obsessed with health and exactly what goes into my children. Respect for life and following the word being the main objective. 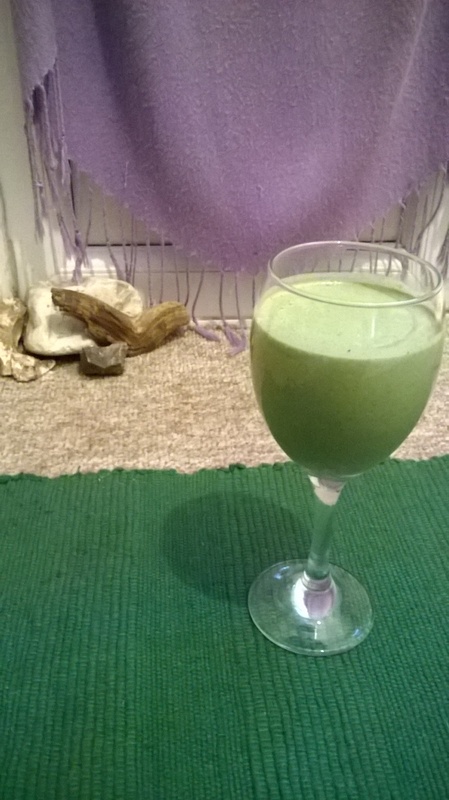 This is the first official smoothie to be worthy of a post, admittedly I was slightly daunted and put off by smoothies as I ignorantly thought they needed a tonne of fruit which would be a) a serious health problem for me and b) totally out of our budget so I shyed away and just didn’t do any. Recently my health has taken a turn for the worst which is extremely hard for me to accept and amend but I am determined to make the needed changes and sacrifice everything I am used to, surrendering to the will of God. Good thing I do have a fetish for Sauerkraut then. All jokes aside it is time to switch out the overly sweet breakfasts and get in touch with these magic leaf powders that will actually help to heal me. Yes this smoothie does contain 2 fruits that are high in fat and probably well over my fructose limit for the day but in my eyes it was a good start, albeit the wrong time of the moon…look out February New Moon your energy is mine! Anyways this little lot made me feel amazing and gave me a magic glow which definitely supressed all hunger until lunch time when the thought of more leaves (Bergamot & Rocket Topped Salad for Lunch) in the form of rocket popped up so yes it was awesome and I felt amazing as I didn’t have 3 breakfasts today! I could really and truly feel the natural high and happiness gifted from this elixir and I am overjoyed I decided to give it a go! Chop the banana and avocado and add all the ingredients into a blender. Use on full power for about 1 minute. Serve and enjoy. So good!